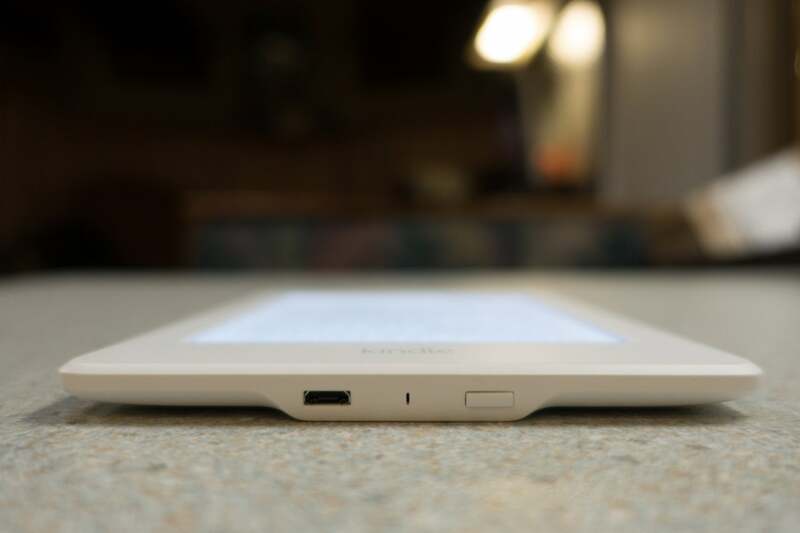 With its desirable features, pocketable size, and reasonable price tag, Amazon’s Kindle Paperwhite has been a safe bet to gift or recommend to voracious readers since 2012. After its most recent design refresh, Amazon’s mid-range e-reader rivals e-readers that cost considerably more. The third-generation Kindle Paperwhite measures 6.3 x 4.5 x 0.36 inches, and it weighs just over 7.0 ounces, whether you opt for one with Wi-Fi or with both Wi-Fi and 3G. That makes it heavier than Amazon’s pricier Kindle Oasis and Kindle Voyage, but lighter than the larger Kobo Aura One or Amazon’s $80 vanilla and feature-lite Kindle. 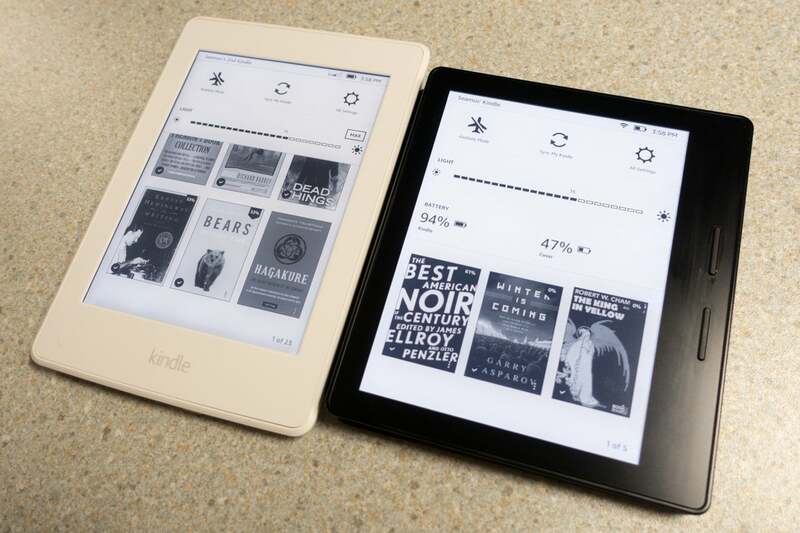 For the first time, Amazon is offering the Paperwhite in white, as well as black. This, along with the a more matte look for the e-reader’s logo and a rubberized back plate are the only notable cosmetic changes this time around. No matter the lighting conditions, you’ll find the Paperwhite to be infinitely legible. Like its more expensive siblings, the Paperwhite houses a 6.0-inch, 300 ppi E-Ink display. Onscreen text appears as sharp as the text you’ll find in any dead tree-edition book. Four side-mounted LEDs light the display, to ensure that the text is readable in any environment, be it while perusing a book on the beach or reading in your darkened bedroom while your partner sleeps next to you. We found the lighting to be fairly consistent with only a small amount of shading in the top and bottom corners. The Kindle Voyage and Oasis offer more even display lighting, thanks to the presence of more LEDs, but they cost considerably more. In addition to the clarity that the Paperwhite’s display and lighting afford, Amazon’s type engine ensures that readers who require larger text in order to read comfortably, prefer a different font than the default one their book was downloaded with, or who prefer different line spacing (depending on whether or not the document can support it) are accommodated. It even supports OpenDyslexic—a typeface designed to mitigate some of the issues that can cause dyslexic individuals reading difficulties. That covers how you’ll read on the Paperwhite. Now, let’s talk about what you’ll read. With 4GB of onboard memory, the Kindle Paperwhite has the capacity to store thousands of books—a definite win for anyone taking a long trip off the grid. Amazon’s collection of available electronic publications is arguably the largest in the world. The bad news is that any book you purchase from the Kindle Store is DRM protected—locking you into using Amazon’s devices and apps in order to read them. The good news is that Amazon makes it possible to share your purchased content with your family members. If your reading habits border on the voracious, it’s also possible to sign up for Amazon’s all-you-can-read Kindle Unlimited service for $10 per month. You can also borrow books from the Kindle Owners’ Lending Library, and Amazon Prime members can read books in the Prime Reading catalog at not additional cost. As for content from outside of Amazon’s walled library, anyone with a computer can transfer DOC/DOCX, ePub, MOBI, PDF, RTF, and TXT files to their Kindle via USB—but the reading experience for such documents typically isn’t as smooth as what you’ll get from publications curated by Amazon. It’s also possible to wirelessly download Instapaper clippings to the Paperwhite. Interacting with the service on the device, however, leaves much to be desired. As with many e-readers these days, the Kindle Paperwhite has no physical buttons except the one used to power it on and off. Navigating between Amazon-purchased materials and other publications is significantly easier, due to the Kindle’s touch-friendly interface. One exception to this is the UI’s on-screen keyboard, which is slow to respond to input when searching your collection, browsing the Kindle Store for a new book, or entering a Wi-Fi password. But this isn’t unique to the Paperwhite. Amazon’s other e-readers suffer from the same issue. On average, reading for a few hours a day with the e-reader’s backlight set at 40 percent, I found that I was able to squeeze around a month out of a single charge of the Paperwhite’s battery. That’s a respectable amount of juice for an E-Ink device. There’s not much to dislike about the Kindle Paperwhite—it excels at fulfilling its raison d’être. It’s perhaps 80 percent as capable as more sophisticated e-readers—the Kobo Aura One and the Kindle Oasis, for example—which cost far more. Despite the fact that its display lighting levels are adjustable, the latest Paperwhite lacks the ambient light sensor that would enable it to automatically adjust its luminosity according to ambient conditions. 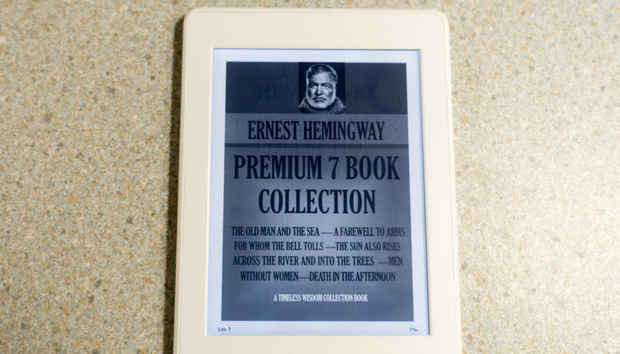 It’s also worth mentioning that if you’re upgrading from one of Amazon’s older Kindle keyboard e-readers, you might be disappointed to discover that the Paperwhite—along with the rest of Amazon’s current lineup of E-Ink devices—lacks the capability to play sound; audiobook lovers need not apply. Finally, unlike earlier Kindles or Amazon’s Kindle Voyage and Kindle Oasis, the Paperwhite lacks physical buttons. To ‘turn’ a page, it’s necessary to tap or stroke the display. While not a deal breaker, it makes reading one-handed something of a pain. Finally, while you can get a Wi-Fi enabled Paperwhite for $120, it comes burdened with Amazon’s ‘special offers,’ a euphemism for advertisements plastered on the device’s lock screen. The only way to avoid the ads is to pay an additional $20, either up front or down the road. If you’re offended by this, check out the Kobo Glo. It can’t match the wide variety of paid and free reading options available for the Kindle, but you won’t have to pay a ransom to avoid ads. MSRP for the model we reviewed—with Wi-Fi and 3G connectivity and without special offers—is $210. The same e-reader with special offers and Wi-Fi only is priced at $140, while the Wi-Fi model with special offers goes for $120.